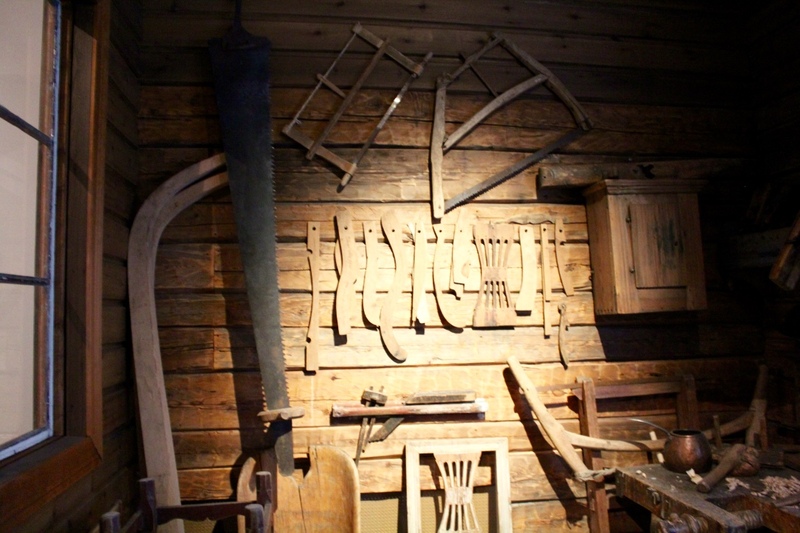 Today I show more spinning tools from the Ostrobothnian Museum in Vaasa. First some distaffs. Flax was grown in Finland until the beginning of the 20th century, and linen was used in clothing and as bedlinen until imported cotton became common. 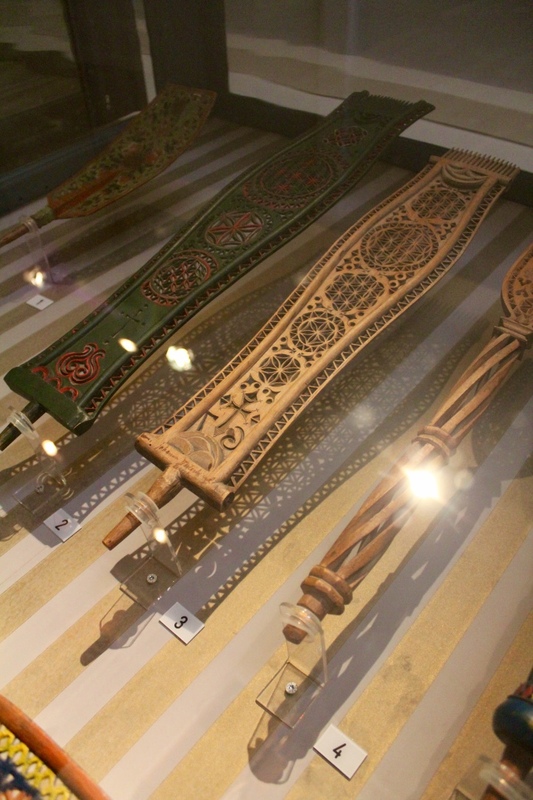 The museum showed three types of distaffs: the flat type with carved figures, the flat type with openwork carving or flower painting, and the oblong square or rounded type. 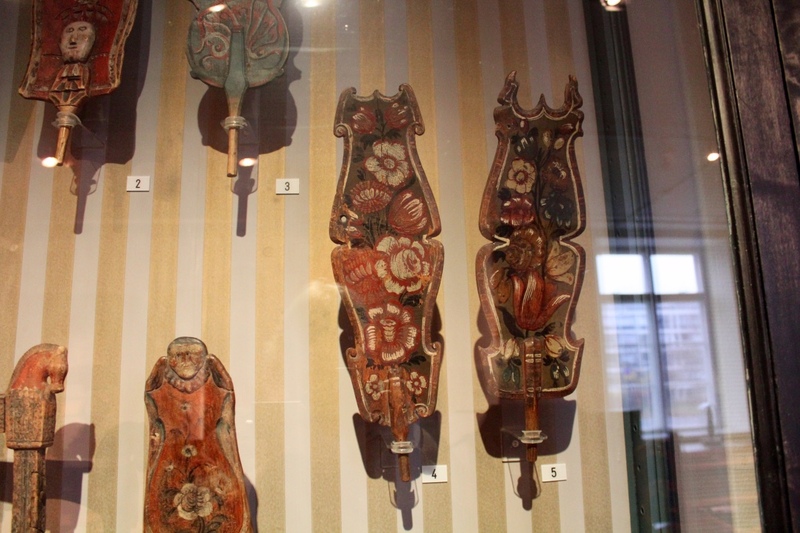 Skilfully made distaffs were gifts from young men to their fiancés. 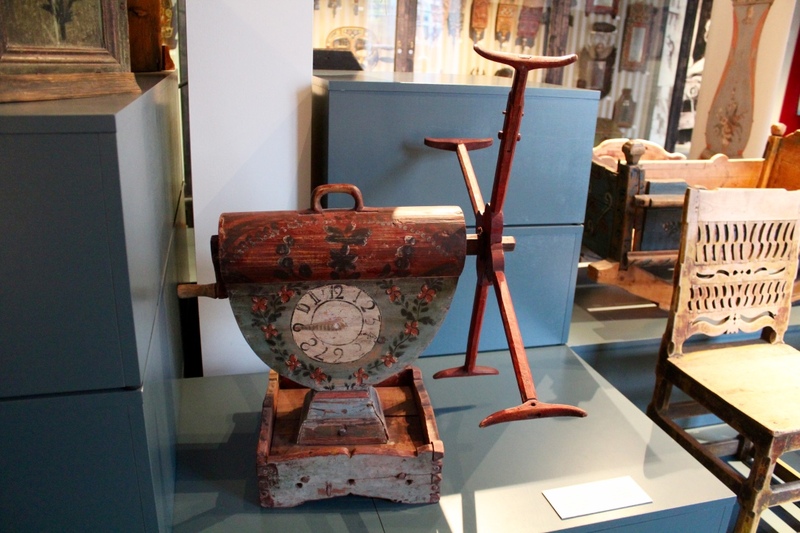 Yarn winders (reels) with a clockwork or counting train needed more skills. They were often made by professionals. 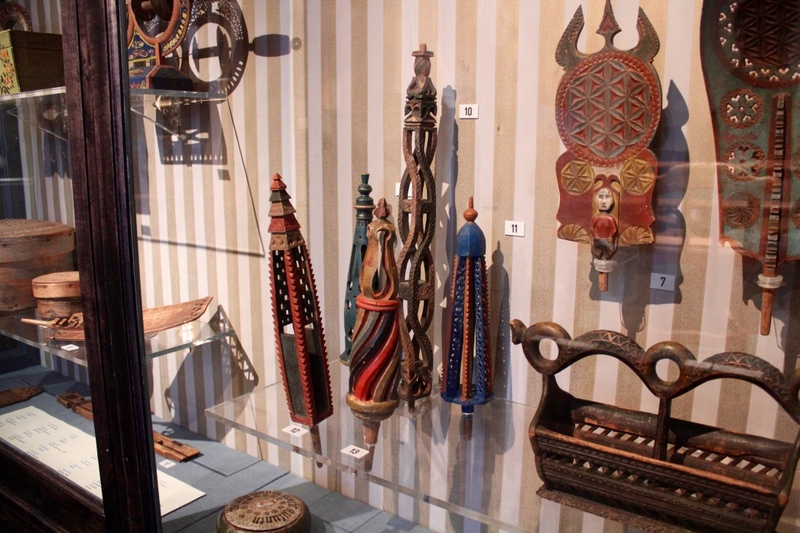 The items displayed here are among the best and most skilfully made. Not all where this elaborately performed. The wood working tools didn’t know anything about electricity… the museum had made a works space right in connection with the beautiful spinning tools, and some awesome clocks that I can’t show now. That saw bench looks pretty much like my father’s. He build our house, did all the wood work and much of the other works needed. 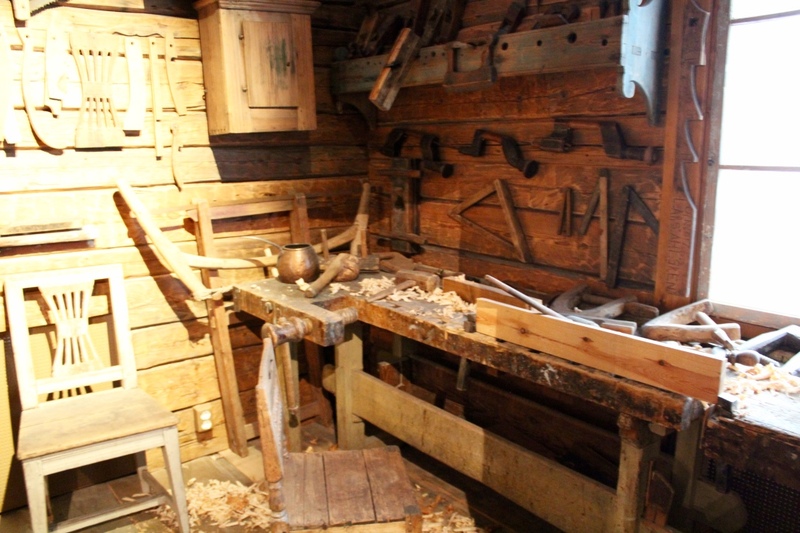 I remember him standing by the saw bench, doing mysterious things with his tools. I spent much time with him there in the cellar, where he had his work space. My brother has his work space there now for his stunning leather handcraft, amongst other skilled things. Such beautiful antiques!! The tools of yesteryear are so amazing. I love that something as simple in concept as a distaff can be so elaborate. Curious as to how they used these — tuck the carved part under the arm? Seems like it could be uncomfortable. 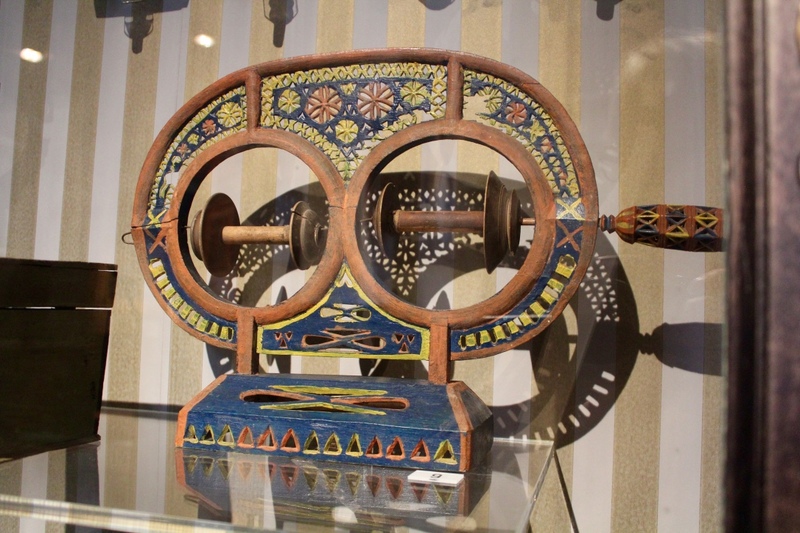 These distaffs where used with a spinning wheel. There’s a part on the wheel on which you attach. 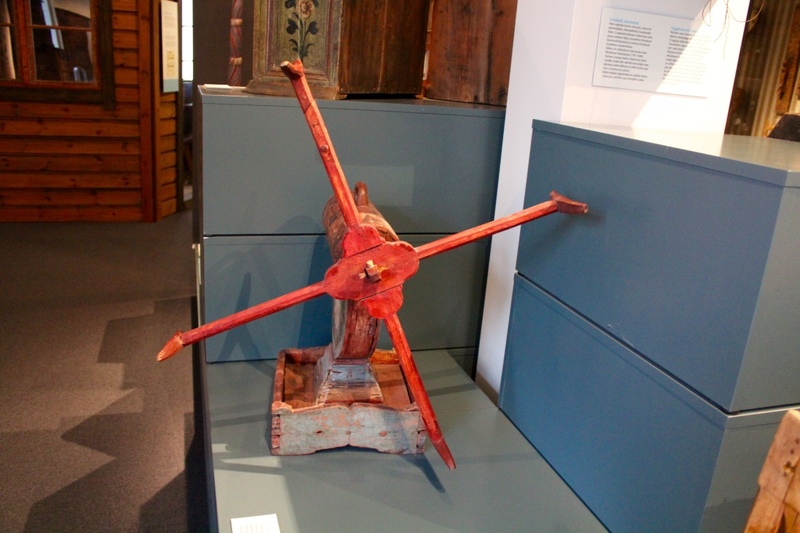 Search Google Images for “saxony wheel distaff” and you’ll find plenty of photos! I didn’t know that! Thanks for clarifying it. Makes loads of sense. November 24, 2015 - 7:24 pm Marilyn F.
What amazing craftsmanship! 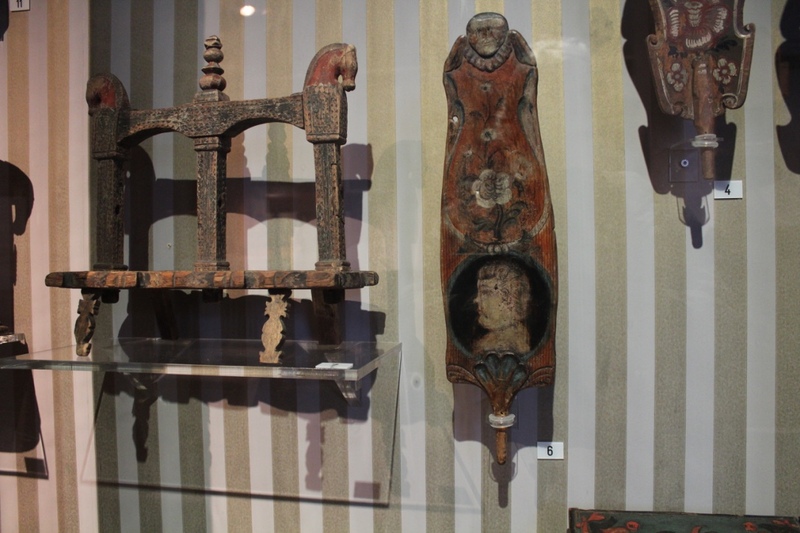 Were they all utilitarian – actually functioning as distaffs or were the more highly decorated ones just for decoration? Some look quite large. The long slender ones look more useful but perhaps they had a special way of arranging the linen on the broader distaffs to spin from. 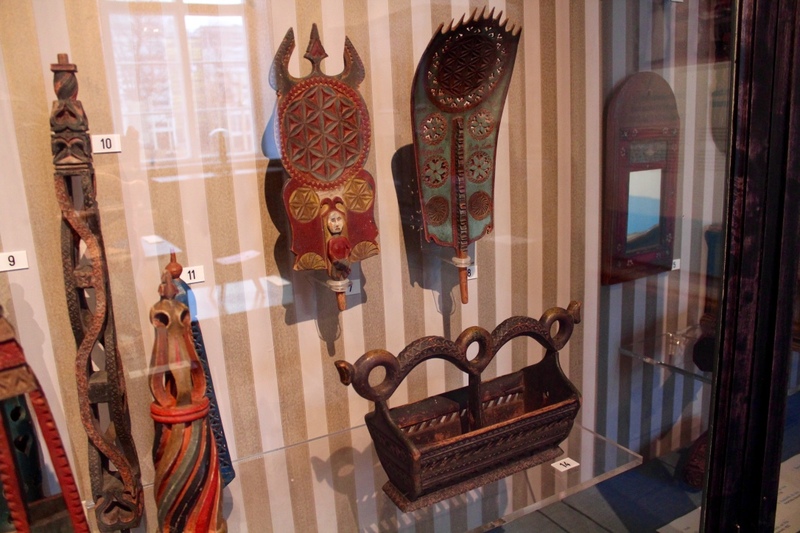 Thank you very much for sharing this wonderful museum collection. What a treat for you to have such a great place close to you. 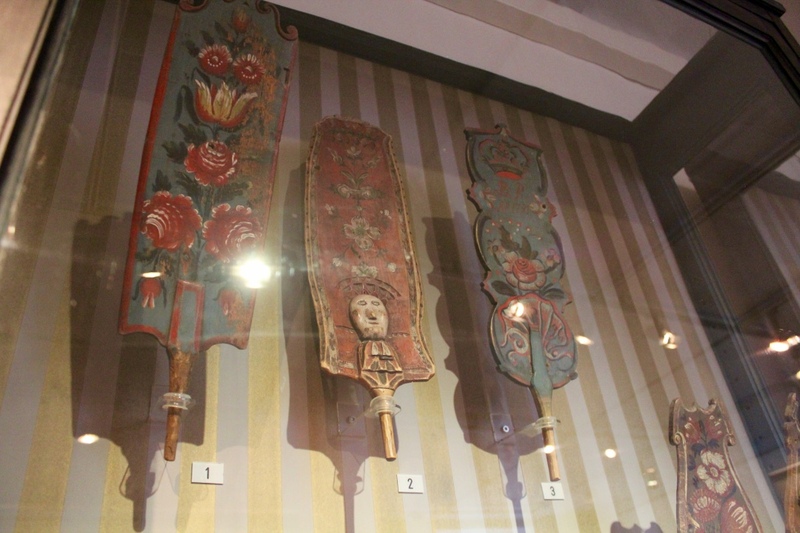 The distaffs have been used, but also kept as decorations. You attach the flax to the comb or the hole on the top of the flat distaff. You can secure it by tying a band around the flax. The flat type is common in Scandinavia and eastern Europe. The big distaffs are especially handy when you spin long hemp fibers. November 25, 2015 - 7:43 pm Marilyn F.
Thanks for the info on how the distaffs were used. Sounds like the fibers were arranged on the front of the distaff and not draped around it like an umbrella, which we mostly see here. And it is used for hemp as well as flax? I’ve only spun short fine hemp and not long fibers. Very interesting. Yes, you attach the fibers to the front on the flat distaffs. If you look closer at photos, you’ll see other types of distaffs also: on the cones and sticks you drape the fibers as you said, in the umbrella form. And if you arrange the fibers horizontally on the cone, you can spin from the fold. November 29, 2015 - 2:57 pm Marilyn F.
I really like the tall narrow distaffs with the comb at the top. Some shapes appeal to some eyes more than others and its interesting that there are so many different shapes and designs. Perhaps they take on the character of the maker as well. Yes, I’m sure you’re right, Marilyn! The distaffs most certainly reflect their makers’ characters. Search Google Images for “Russian distaffs”! And Swedish: “rockblad”. Finnish: “rukinlapa”. Or, “distaffs”, for hits all over the world. November 29, 2015 - 4:05 pm Marilyn F.
What a great idea to google distaffs from different countries! Thank you! 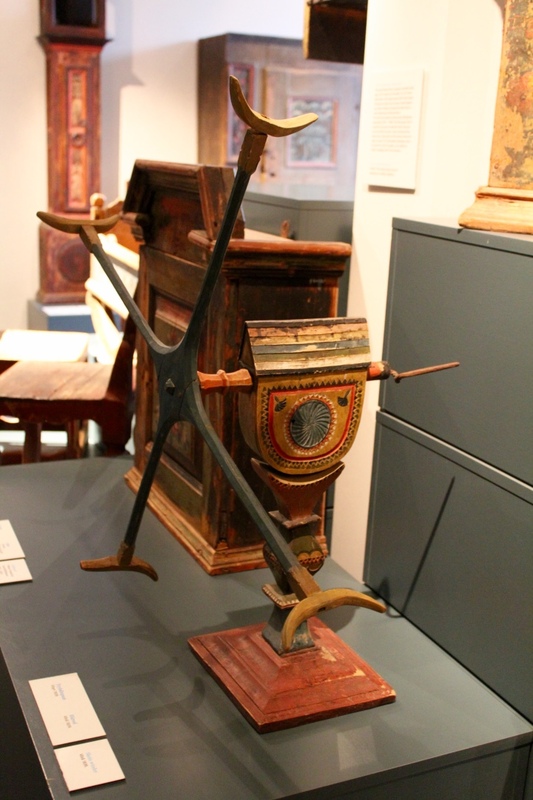 What I most enjoyed about this post was seeing evidence of the intermingling of women’s crafts and men’s crafts. It reveals a deep respect towards both skills and an understanding that both skills were vital to family survival. I found that very moving. You’re right, I hadn’t thought of that! 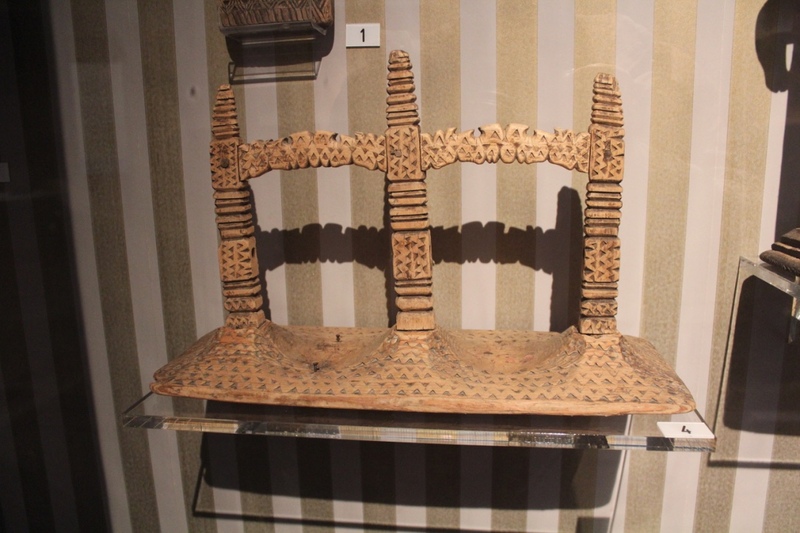 Usually you see hard and soft crafts separately in the museums. I’ll give them your feedback! Amazing work. 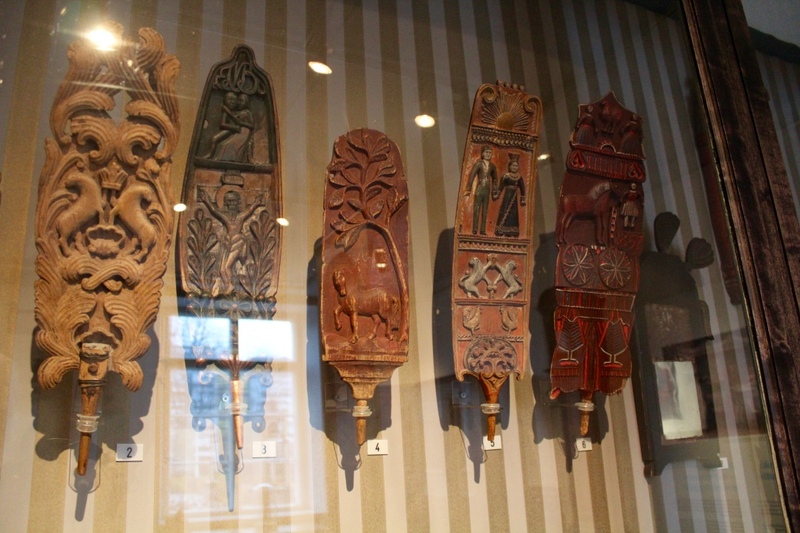 I especially love the horse carved on one of the flat ones but like all the beautiful painting. What attention to detail for such utilitarian objects. Nice.